Rich in history, blessed with stunning scenery, and offering wonderful opportunities for outdoor sports and recreation, Bentonville is a city on the move. Part of the vibrant Northwest Arkansas region that ranks among the fastest-growing in the US, this charming city of almost 36,000 draws deeply from its pioneer roots and Ozark heritage. Family-friendly neighborhoods and its intimate historic Downtown reflect the city’s small-town and rural community values, yet Bentonville welcomes newcomers and supports business, and is full of excitement about the future. Be sure to check out CRYSTAL BRIDGES ART MUSEUM in Downtown Bentonville! - One of Nicky Dou's favorite new HOT SPOTS! The Peel Mansion was built with meticulous care in 1875, using the best local materials and craftsmen. With his wife Mary, Colonel Samuel West Peel, a pioneer businessman, Indian agent and Confederate soldier who became the first native-born Congressman from Arkansas, raised their nine children on the farm and apple orchard surrounding the house. A splendid example of an Italianate mansion, it has been beautifully restored and furnished with extraordinary period furniture and embellishments to create an authentic early Victorian ambiance. In addition to its historic and scenic charms, Bentonville has become famous as the home of the founders of Wal-Mart and the site of their first retail outlet. The original Wal-Mart still stands in Bentonville’s town square, serving as a visitors’ center to illustrate and remember Wal-Mart’s history, its rural roots, and the philosophy of its founders, who exemplified the small-town virtues of frugality, hard work, and dedication. The front of the premises recall an old-time “five and dime” store, while the rooms in back form a kind of museum housing relics and memento's marking the stupendous success of the Walton family and their company. Crystal Bridges Museum of American Art in Bentonville is one of the foremost art museums in the United States. Set in gorgeous Arkansas woodland, the stunningly designed Museum is the brainchild of Alice Walton of Wal-Mart fame. Most of the 25,000 square feet of gallery space houses masterworks of American art from the colonial period to the present day. The Museum also features a 250-seat indoor auditorium, areas for outdoor concerts and public events, sculpture gardens and walking trails, and exhibits of Native American art as well as the work of regional artists and special collections from national art institutions. Bentonville is a rapidly-growing town in an area experiencing high population growth and economic expansion. Its real estate market currently favors buyers, with a very wide range of homes available in all price ranges. There is growing interest in upscale residential developments and gated communities in the area, including some fabulous lakeside and golfing communities. Some of my favorite neighborhoods include Chapel Hill, Rolling Acres, Hidden Springs, Lochmoor Club, St. Valery Downs, Talamore and many others. 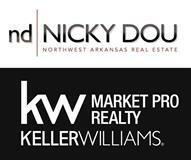 For more details on specific neighborhoods in Bentonville - contact Nicky directly @ 479-236-3457. For garden and nature lovers, a visit to the newly opened Botanical Garden of the Ozarks is a must. The Garden’s 86 acres adjoin Lake Fayetteville and include nine separate gardens on themes that highlight the beauty and environmental variety of the Ozarks. There is also an amphitheater, boat rental facility, exhibit gallery, observatory cafe, education center, conservatory, special children's area, and trails for walking and biking. You don’t have to love motor bikes to enjoy the fabulous Bikes, Blues, & BBQ Festival, held each Fall just down the road in Fayetteville. Attracting as many as 350,000 avid onlookers, this four-day event features dozens of bike events, some of the hottest national and regional blues, rock, country, and jazz bands playing free on two stages, “babe” contests, mouth-watering food of every kind, and much more. Offering something for everyone, the Festival prides itself on its contributions to regional charities. Find and compare local neighborhood home values in Northwest Arkansas.